New property on Input elements. 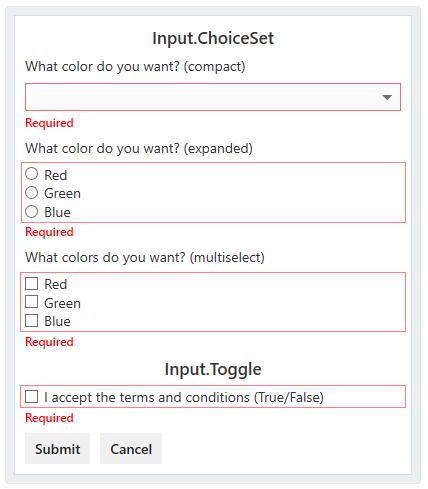 validation InputValidationOptions false Specifies the validation options for the input. errorMessage string false Specifies the text that will be displayed if validation failed. This is optional but strongly recommended. If not provided, there will be NO error message displayed (the field will simply be visually highlighted as invalid). In the future, you can imagine we'll add regex to the options. optional Default. The input is optional. required The input is required. 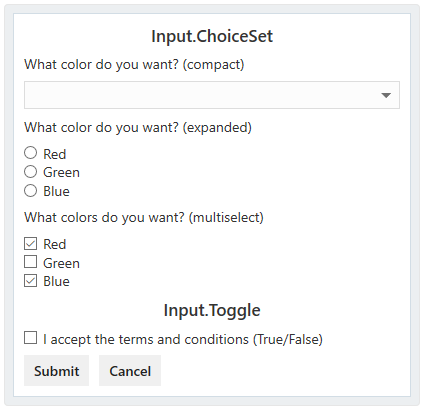 Actions that require inputs will be blocked until valid input is provided. requiredWithVisualCue Same as required, except this adds a visual cue to indicate the field is required before the user has even interacted with the card. New property on Action elements. ignoreInputValidation bool false Defaults to false. If this is set to true, any input validation will be ignored when the user clicks the button. Useful for cases where you have a "Save" button (that requires inputs) and a "View" button (that doesn't require inputs). OPEN QUESTION: Should we also allow authors to provide custom text for the validation error? Maybe that's a vNext feature? Or maybe we do it now? It probably shouldn't be required for authors to provide that text though, there's something nice about not needing to provide that text. "text": "Please confirm your username"
User changes the input value, we remove the validation error. We'll re-validate upon button press again. So even if they type "a" and then delete it, the validation error should remain removed. Note that we do NOT place the validation above the input, since it breaks the flow of the header text related to the input. And we can't place the validation above the header text, since inputs don't have a header property. No changes. We'll use the attention color for the error text. Medium. Authors need to expect that users running down-level can still submit the card with empty inputs (most concerning for new authors who might assume that required property works, existing authors should already have that logic). None. Hosts could choose to native style, but they don't have to. A renderer must respect the required inputs and not allow action execution until the required inputs are fulfilled. A renderer should display the validation errors as described in this spec. If displaying validation errors, a renderer must use the text provided in the errorMessage. If none is specified, that's a parse error (since it's required). Didn't the XAML validation changes to the Text Input controls get pushed back to 19H1? Android by default support field validation, but I can't speak for iOS. Do the FluentWeb/Fabric fields support validation states for HTML renderers? We would add validation UI ourselves for platforms that don't have any. Approved, updated with changes from our proposal review for adding the validationFailedText property. Note that in the proposal review, we discussed the ability to specify the validationFailedText higher up, and let it cascade down to all inputs, but we decided that for now we'll just leave it on individual inputs. If that request comes up in the future, we can always add it. Thanks for the wonderful work team. I understand that asking for a release date is bad, but we're using adaptive cards heavily in one of our bots and input validation is one of the important features we're missing. Do we have any tentative date for the 1.2 release or is any beta url for 1.2 with Input validation that I can test ? Thanks @vijaysaimutyala! We still don't have any release date to share, but we've almost implemented all the 1.2 features so we're nearing the end. However, we haven't implemented this feature yet, so there's currently nothing you can try out. But this is a high priority feature (and planned to be part of 1.2), so we'll be working on it soon! By the way, this feature only allows you to mark a field as required. It does NOT provide support for validating a valid email address, phone number, etc... if you need those features, let us know (and those will be addressed in a separate feature). Thanks! Glad to know this @andrewleader. Marking the field as required will have most of the job done. But client side verification of inputs like email address or Phone Number like you said would be great. I'll try and come up with what all inputs validations will be useful. Thanks. I don't think we should require the failureMessage property. I think a built-in default failure message would be enough in case the property is omitted. I think ignoreInputValidation should be a property of Action.Submit (and Action.Http) only, not a property of the base Action type. Good points, I agree with renaming to failureMessage or failedText or errorText (definitely should get rid of the leading "validation"). For the built-in default failure message, our concern is that it means we have to provide localized text for the default failure message. Additionally, we believe that in most cases, developers use custom strings anyways (but that's just a guess, we don't have evidence backing it up). Our main concern would be the localized text. Agreed about ignoreInputValidation only being on actions that submit data from the inputs (like Submit/Http). I can start a conversation with the whole team about these points Monday, but some more clarity around why you think we should have the two middle features will help! @andrewleader I know about that localization concern given I am part of that collective "we" you reference and helped shape this spec. As I implement it though, I do believe requiring the failure message is overkill. Maybe our default should be to not show an error message if not specified; this eliminates the localization issue. The method needs to exist anyway in some form; it would be how the renderer decides to trigger the onExecuteAction event or not. We might as well make that method public. But the actual use case is those hosts that have constrained height cards; there is not space to display the error messages in the card itself within messing up with the overall layout. Such hosts will want to display error messages their own way, say in a popup for instance. I suggest we use errorMessage (which is somewhat standard) instead of validationFailedText. That's what I will implement now, and I can always change it if necessary. Renaming validationFailedText to errorMessage (because "validation" is redundant since it's already inside a validation object, and error message sounds more accurate). Changing validationFailedText/errorMessage property from required to optional. We will NOT provide a default error message, so we still recommend developers provide an error message, but don't require it.